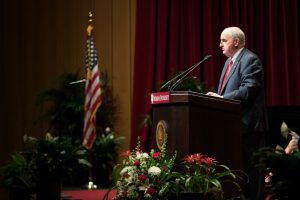 Indiana University President Michael A. McRobbie presided over a ceremony at IU South Bend marking the start of $4 million in renovations to Riverside Hall. When the renovations are complete, it will be the hub of health sciences programs, classes, and health care for students, faculty, staff, and community residents. IU President Michael McRobbie speaks at groundbreaking ceremony. 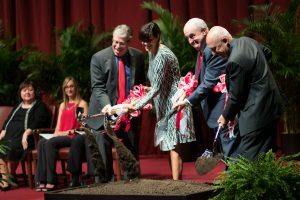 (L-R) Chancellor Terry Allison, Trustee Melanie Walker, President Michael McRobbie and Trustee Phil Eskew break ground for renovations at Riverside Hall. “The renovated Riverside Hall will help address major risks to individual health and the declining measures of public health in our state,” said McRobbie. The project will refurbish and modernize more than 11,000 square feet – the entirety of the building. New mechanical, plumbing, electrical, data, and security systems will be installed, along with updated clinical space, laboratories, radiology equipment, a pharmacy, classrooms, and offices. When completed in the fall of 2017, Riverside Hall will be the new home of the expanded IU South Bend Health and Wellness Center and enhanced programs in health sciences. “The renovated Riverside Hall will provide excellent teaching and learning opportunities for students and faculty, along with providing low-cost, high quality care for those in need,” said IU South Bend Chancellor Terry L. Allison. “Students and faculty in Dental Hygiene, Nursing, Radiography, Clinical Lab Sciences, and other health professions will have expanded opportunities to work directly with patients,” he added. Funding for the project includes a $1 million gift from the Vera Z. Dwyer Charitable Trust, matching gifts, campus funds, and operational support from HealthLinc. HealthLinc is a federally qualified health care center operator with clinics in East Chicago, Valparaiso, Knox, Michigan City, Mishawaka, and at IU South Bend.